Most of our software is available for direct download for authorized persons and entities. If you are a new user of our software and need to be able to download it in order to install on your system or simply need to re-install it on an existing system, please email our IT department at downloads@gafsis.com for instructions. For existing users, you may point your browser to http://www.gafsis.org/protected/ to download the file(s) of your choice. Please note that this directory is password protected. 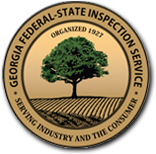 You must be authorized by Georgia Federal-State Inspection Service and set up with a username and password in order to access the files and software. NOTE: The procedure below makes use of an encrypted password protection scheme. You will be asked for a username and password. If you do not have one, please contact the Georgia Federal-State Inspection Service's IT Department. Create a folder which will contain the downloaded file. It may be easiest to put this folder on your desktop. In the address bar of the browser, type http://www.gafsis.org/protected/ and press the Enter key on your keyboard. You will be asked for your username and password. Please enter each and press the OK button. Click onto the directory that contains the file(s) or software that you desire. Right-click onto the file of your choice and click "Save target as...". Navigate to the directory of your choice and press the Save button. If the window (or a similar one) asks for authorization to download the file, authorize it do so. Click the "Open folder" button and verify that your file downloaded as expected. CONGRATULATIONS! You have downloaded your file. Many times it becomes necessary for someone to send us a file during the course of a troubleshooting session. The required files are often too large to be sent through email. In such cases, an alternative method is needed to allow the files to be sent and retrieved. The solution is our FTP File Upload area set up on our server specifically for this purpose. NOTE: The procedure below uses anonymous FTP. You should not be asked for a username or password. In the address bar of the browser, type ftp://ftp.gafsis.org/ and press the Enter key on your keyboard. On the menu at the top, click "View" and then click "Open FTP site in File Explorer". Minimize all windows except the Windows Explorer window that just opened. Resize the Windows Explorer window and drag it to the side so that the desired file or folder is visible on your desktop. Drag the desired file from the desktop and drop it on top of the folder labeled "incoming" in your Windows Explorer window. Watch for a notification window that will state "Copying ...". Once it disappears, then your file has been uploaded. Notify the IT Department at GA FSIS that your file has successfully uploaded. CONGRATULATIONS! You have successfully uploaded your file.